Do you have a child who simply loves animals? Then, you will definitely want to check out Zoobooks, which is an online bookstore offering one of a kind, amusing, and educational books and other products on animals for children. The purpose of Zoobooks, which was established in 1980, is to educate children in a fun manner so that they not only learn but have a great time doing it. Every book contains information and colorful pictures about one type of animal or an animal family. Children (and adults) will enjoy reading the interesting information on a wide variety of animals. You and your children will likely enjoy the beautiful images just as much. The colorful and fascinating pictures are a feast for the eyes and are sure to keep your children captivated. Your children will keep returning to these books to look at the pictures once again and to learn more about the fascinating animals around the world. Topics include the anatomy, habitat, socialization, and reproduction of an animal or animal family. Zoobooks are available in nine different languages, so the books are great for families around the world. 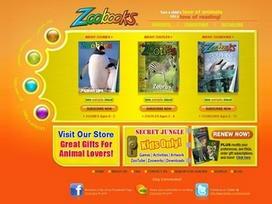 Zoobooks also offers Zoobooks Magazine for children ages six to twelve years old. Each magazine issue includes descriptions of different types of animals, reptiles, and insect; twenty pages of drawing and photographs of animals; maps of where the animals live; and a pull-out section containing activities such as number games, puzzles, and make-it-yourself projects. The magazine does not contain any advertisements, so each issue is 100-percent educational, intriguing, and fun! If your children are still a little too young for the Zoobooks Magazine and books, no need to worry or delay introducing your children to the world of animals. Zoobooks also offers Zootles Magazine for children ages two to six. In this magazine, you will incredible photography and fascinating facts about animals. You will find activities that are age appropriate, as well as a Resource Corner, where you will find great tips on how to share in the fun and help your little ones continue learning well beyond the first time going through an issue. Each issue also contains a featured color, number, phonetic sound, and letter, helping you introduce these basic concepts to your children, which are the essential building blocks for higher-level learning. Zoobooks has also made its website a fun place to explore. Your children will be sure to enjoy the many games and activities waiting at the Zoobooks website. For example, your little ones can choose from Animal Olympians, Rainforest Games, Mystery Challenge, and Guess Who I Am. Also, be sure to show your children the virtual zoo, which contains a multitude of information on a wide variety of primates, birds, aquatic animals, arachnids, bears, and other types of animals. You can even listen to audios of what the animals sound like. If you are a teacher, you can use the many resources on the website to enrich your lessons. The website even includes thematic curriculum. Both you and your students will have a great time learning more about the many animals nearby and far away. Zoobooks opens new learning opportunities for kids. Bring a smile to your child's face with the products available at the Zoobooks website; you'll find that you will be smiling too! Share what you think about Zoobooks, and your favorite ways to save there!